This volume shows how The Doctrine of Essence intersects with perennial philosophical questions including above all, the relationship between freedom and determinism. The Doctrine of Essence is of central importance, since it is a critical description of traditional categories which also functions as the justification of Hegel's speculative understanding of essence. 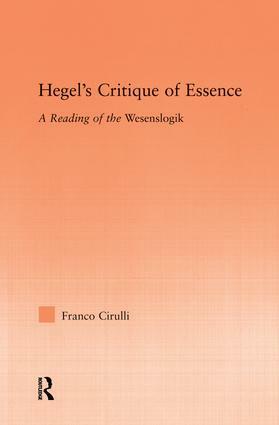 This study takes an historical approach to build upon Hegel's abstract argument, viewing it as a confrontation with his predecessors, inparticular - Fichte and Schelling. A Newton of a Blade of Grass (From Substance to Subject)?